(Newser) – President Trump took flak from critics for congratulating Vladimir Putin on his election victory during a phone call last month. As it turns out, the call appears to have been even chummier than thought. A Putin aide said Monday that Trump invited the Russian leader to the White House, though he added that no plans have been set, reports the AP. 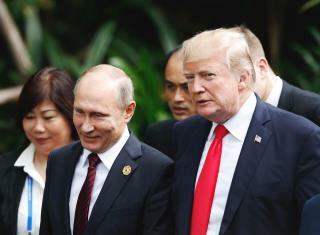 It had been previously reported that the two leaders discussed meeting in person during the call, but the White House angle adds a controversial new wrinkle given the allegations of Russian meddling in the election and the poisoning of a former spy in Britain. So many negative comments about President Trump.People making these comments will someday realize how wrong they were.They will look back and appreciate the fact that they were alive to witness the greatest President in history of United States save our Country from a globalist idealism that had infected the corrupt liberal government and was being forced upon the people by biased fake media.You will all praise the way he fought against corrupt establishment to Make America greatest once Again. You blinded by your ignorance right now but someday you will open yours eyes and see President Trump was a gladiator willing to fight for all Americans against a swamp that had never been defeated and against all odds was victorouis. Birds of a feather. Remember DT praising Putin for killing journalists. 80% of Russian people abroad voted for Putin.